It’s only February so I’m sure this will come as good news to those still hanging in there on their ‘new year, new me’ health kick. 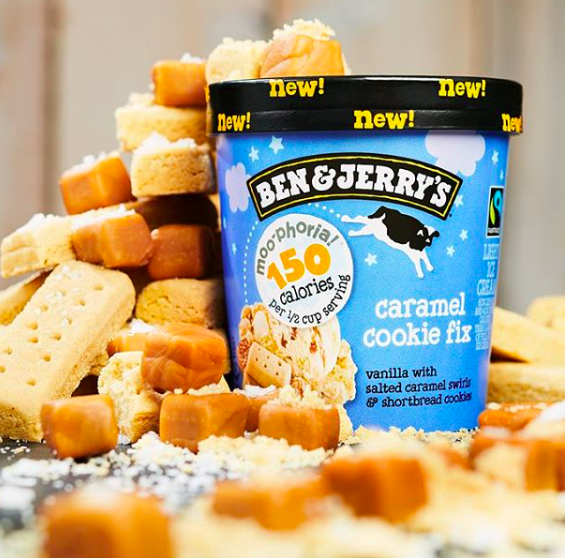 Ben & Jerry’s have launched a low-calorie ice cream in three delicious flavours – Chocolate Milk and Cookies, P.B. Dough (peanut butter) and Caramel Cookie Fix. Chocolate ice cream with chunks of chocolate chip cookie dough – 140 calories per serving. To everyone who dunked their chocolate chip cookies in chocolate milk as a kid, this flavour is for you. All the yum of chocolate, vanilla, and cookies, in a light ice cream flavour that even your inner kid would go bananas for. Chocolate ice cream with gobs of chocolate chip peanut butter cookie dough – 160 calories per serving. Is there anything more euphoric — er, Moo-phoric, we mean — than cookie dough? We think not. That’s why we packed this pint with more gobs of chocolate chip peanut butter cookie dough than you can shake a spoon at. Vanilla ice cream with salted caramel swirl and shortbread cookies – 150 calories per serving. This comes after Ben & Jerry’s announced three flavours of dairy free ice cream. Vegans and those who are lactose intolerant can enjoy the delicious taste of Ben & Jerry’s in Chunky Monkey and Chocolate Fudge Brownie, and Peanut Butter & Cookies. Chunky Monkey is banana ice cream with chocolate chunks and walnuts, Chocolate Fudge Brownie is a chocolate combination of ice cream and brownies, and new kid on the block Peanut Butter & Cookies is vanilla ice cream with chocolate cookies and peanut butter swirls. All three are made with almond milk and are fair trade. If you’re not overly fussed about lower calories or dairy free, and just want the ice cream for what it is, there has been some other exciting news this week. Several ice cream versions of Kinder Bueno are about to be released. They are being released around the world and although it currently doesn’t look like one is coming to the UK at the moment, let’s keep our fingers crossed! There’s a Bueno stick described as being made of vanilla and Kinder flavoured ice cream and coated in chocolate and crunchy hazelnut pieces. And, book your trips across the Channel, a Bueno sandwich – the same ice cream sandwiched between two tasty and nutty biscuits. I’ll take all of the above. Thanks in advance.